Speakers at news:rewired – noise to signal, which was held at Thomson Reuters on Friday, shared numerous tips on social media tools that are of use to the journalist when newsgathering and sorting out the social media chaos. Bell called for journalists to lose their Twitter eggs – the default photo icon used by Twitter on sign up – and to embrace the personal aspect of Twitter as a news tool. Mann has lists for topics and subjects in the same way that news organisations have specialist correspondents and areas of interest. By clicking on a term at a location you get the tweets coming in but also a thumbnail of the pictures and videos attached to that term and some of the top links. Now the brilliant part of this is that the pictures appear and the videos play out in a frame on the website so you’re not constantly redirected. Any application that does this is of little use when the social media signal is loud. 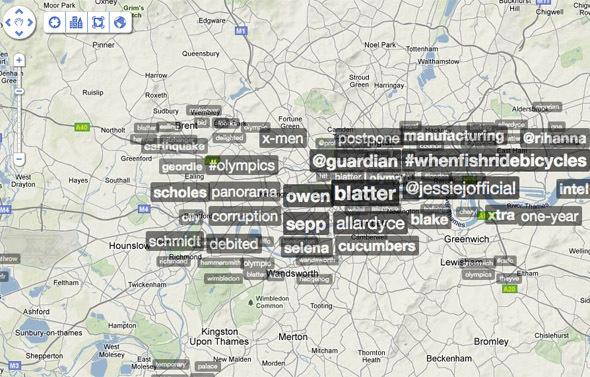 Trendsmap also has a list of Twitter terms breaking globally at the bottom of the page and can drill down to locations. This is a brilliant brilliant tool. One tip I would have when the strength of the social media signal is maxing out your API is that when you’ve found an interesting picture or video your first reaction should be to scroll down on the tweet stream. If the scroll bar is at the top, the application will keep on calling the Twitter API so you’ll see a flash of 100s of tweets and then it’ll disappear as the next lot comes in. If you scroll down the application will stop calling the API and stay on the list where you’ve found your picture/video of interest i.e. you won’t lose the original tweet the link came with. You will need this for verification. Another thing you should be aware of is that tweets appear on Twitter in a language which does not use the Roman alphabet e.g. Arabic. This is a write only function enabled by something called Unicode. This is not a read function in so much as no computer or trending algorithm can read it. This is bad in one way, in that no language which doesn’t use the Roman alphabet can produce a trending term. But it’s good in another way, all links and hashtags have to use the Roman alphabet, and that’s all you need (since you can throw the body of the tweet into Google Translate). The next best tool to sort out the social media chaos is the Twitter search. This is not the search bar in Twitter but a well hidden URL – search.twitter.com which has an advanced search where you can pare down to place, hashtag, person, date, etc. If you search for a word it’ll include the hashtag. The presentation and navigation are great with hashtags being linked as well as the links to web articles appearing as in Google and not just a constricted url. To look at how much interest is being generated regarding the term you’ve searched there’s a nifty count on the left column. You can search by relevance or the latest and by web, tweets or photos. There’s a category called ‘exerts’ which I imagine is more the business model of this search as I don’t find it particularly useful or logical. What I do find useful is that to add colour to a story you can measure the volume of buzz generated by a term and compare it to another. This works particularly well for sports stories where you want to see which players fans are talking about which their club might buy, etc. The downside is Topsy is not real time so you’ll have to hit ‘search’ to get the latest. 8. A Foursquare search in Tweetdeck to verify a location of a source. Tipster: Nicola Hughes @DataMinerUK as stated in a post on her DataMinerUK blog. She explains how she did this to verify a photo of an erupting volcano in Indonesia. I found the original user by opening up the photo in Twitpic. I pulled up her profile in TweetDeck. Her location was not given in longitude-latitude (when the location is given as a string of numbers with commas that’s longitude-latitude, just plug that into Google Maps and you get the location). I added her to my ‘sources’ list and in the TweetDeck column filter box I typed in ‘4sq’. This is a Foursquare check-in link on a map. She had checked into the Atma Jaya University in Yogyakarta 30 minutes before she posted the photo. I looked at it on Google Maps using the terrain layer to confirm the angle of the picture looked correct. On her Twitter profile she had a link to her blog. From the about page I found out she was a science communication student and got her real name (nicknamed used on Twitter). I called up the university and asked to be put through to the science department. I then asked to be put through to her dorm room. She answered the phone and we got her onto the roof reporting what she saw and followed her throughout the evacuation. I would have one account for the whole organisation so everyone can access the bookmarks from a web page but also because the extension means that if you search for a term covered by a bookmark in Diigo it will be flagged up in your Google search. What I think could make this of the utmost value is that you can tag a bookmark. So for each loud event I would tag the picture/video/blog link with the hashtag (the Chrome widget will remember your last tag so you don’t have to type it out each time) and add notes about the place, person and time. The newsdesk can look at these links and when verified add the tag ‘verified’. Now there’s a Diigo mobile app where you can search for bookmarks via tags. All the field producer/reporter has to do is set up the app to search by tags (it’s part of the settings) and put the hashtag of the event you’re heading out to cover and ‘verified’ into the search bar. Not only will this bring up the the links to the images and videos coming from the ground but you can download them and look at them offline (eg when on a flight or away from a 3G signal). It’s something you can pull up on your phone, show to a fixer/translator aand ask ‘Do you know where this is and how far away are we?’.